VATICAN CITY (CNS) — If it seems hard to find God in this world, it is because he chooses to be with the defeated and dejected and in places where most people are loath to go, Pope Francis said. 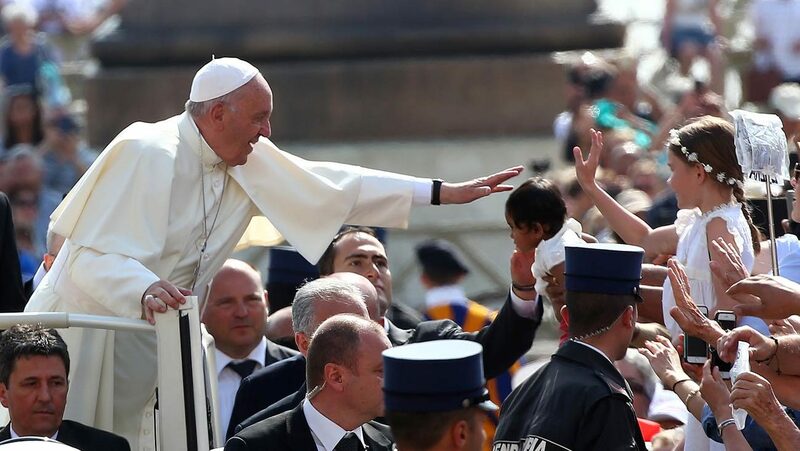 “God does not like to be loved the way a warlord would like, dragging his people to victory, debasing them in the blood of his enemies,” the pope said May 24 at his weekly general audience in St. Peter’s Square. The audience began just after Pope Francis had met U.S. President Donald Trump. “Our God is a dim flame that burns on a cold and windy day, and, for as fragile as his presence seems in this world, he has chosen the place everyone disdains,” Pope Francis told the crowd in the square. Continuing his series of talks on Christian hope, the pope looked at the Gospel of Luke’s account of the two disciples traveling on the road to Emmaus after Jesus had been crucified and buried. In the story, the pope said, the disciples, are struggling to understand how such a fate could have befallen the man they had faith in: the son of God. But just as Jesus was on the road with the disciples, the pope said, he is also walking with everyone on their journey through life. “Jesus walks with all those who are discouraged, who walk with their head down,” so he can offer them renewed hope, he said. Even though he knows what is bothering the disciples, he asks them a question and listens patiently, letting them tap into the depths of their bitterness and sadness. In fact, he added, the hope felt by those who have never suffered may not even be hope at all. The disciples initially didn’t recognize God on the road because their hope had been in a victorious, conquering leader, the pope said. They only recognize him when he takes the bread, blesses it, breaks it and gives it to them — exactly like he did with his own life. The church needs to be just like Jesus, not staying in a “fortified fortress,” but out where everything is alive and happening — on the road. “It is there (the church) meets people, with their hopes and disappointments,” listens patiently to what emerges from their “treasure chest of personal conscience” and offers the life-giving Word and witness to God’s love, he said. This is how people’s hearts are rekindled with real hope, the pope said. At the end of the audience, the pope greeted pilgrims from Hong Kong on a day dedicated to Our Lady, Help of Christians, who is venerated at the Shrine of Our Lady of Sheshan in Shanghai. Pope Benedict XVI established a world day of prayer for the church in China on the feast day.